These are the results from a small sample of DDR3 UDIMM ECC tested on Intel® Xeon® processor E5-2600 v2 family. 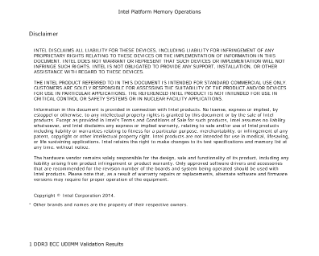 This information is provided as a guide to module compatibility with Intel® server reference platforms. This testing is not intended to replace the normal OEM qualification process. For results on specific Intel® motherboards or OEM production motherboards, please refer to the OEM’s list... of qualified memory suppliers. Dynamically monitor power management at all data center levels, optimizing throughput, load balance. Animation: Overview of the new features and capabilities for cloud solutions, big data, and more.